Issue 48 of Intellectual Asset Management (IAM) magazine is now available online and in digital format. The cover date is July/August, but don't let that worry you. "For six weeks during January and February this year, IAM and the IP Solutions business of Thomson Reuters offered readers of the magazine and the IAM blog the opportunity to take part in our second annual benchmarking survey. The 700-plus in-house and private practice IP professionals who agreed to do so answered detailed questions that focused on issues such as patent quality, portfolio creation and management, litigation, licensing and the alignment of IP with overall business strategies. 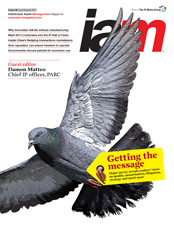 The results of the survey – along with comments on its findings from a number of well-known individuals in the IP world – form the cover story of this issue. IAM 48 is also special for another reason. It marks the first time that we have invited a highly regarded chief IP officer to guest edit the magazine. The person in question is Damon Matteo, from the Palo Alto Research Centre (PARC). ... Our thanks go to him and to the authors he selected to write for us: Vincent Pluvinage, formerly of Intellectual Ventures; Peter Holden of Coller Capital; Nader Mousavi of Sullivan & Cromwell; and Dan Figueroa of Sony Computer Entertainment America. Look out, too, for the profile of Damon and PARC written by new IAM reporter Helen Sloan. ... In a very full issue, we also have our regular IAFS contribution and a fascinating insight into the developing IP transactions marketplace in China. In addition, we carry a management report on IP issues in the life sciences industries.. ..". You can check out the contents of this issue in full here.